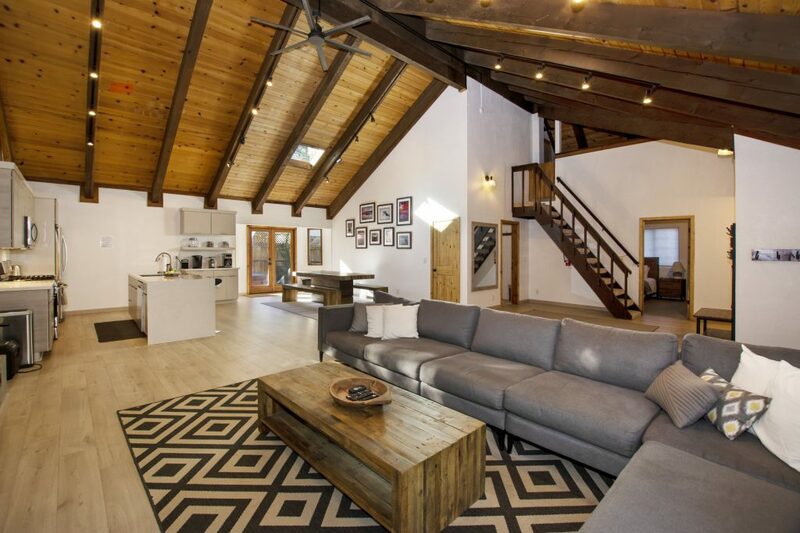 Combining the sophistication of Palm Springs and the rustic nature of the mountains, Summit Creek Pines should be your next cabin rental in Big Bear Lake! The striking wide plank floors in grey tones complement the low line sofa and perfectly contrast with the natural honey color of the vaulted knotty pine ceiling. 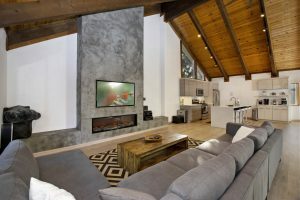 The floor to ceiling cement fireplace with it’s modern stretched gas insert brings the coziness of a mountain cabin to the overall minimalist nature of the space. Rustic tables pair perfectly with the industrial elements of the oversize ceiling fan and light fixtures. 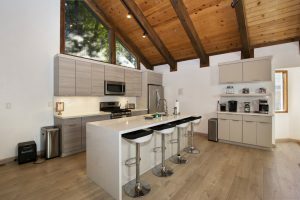 The kitchen provides a touch of glam to the great room with it’s waterfall stone counters, under cabinet lighting and sleek coffee station. The space is perfectly designed for entertaining, whether it’s a holiday family gathering or weekend away with friends. The bathrooms have been designed with luxury in mind and continue the classy grey theme with marble tiles, and glass and metal accents. 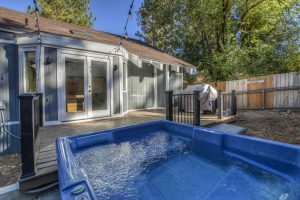 Just like a Palm Springs retreat, the back yard has been thoughtfully planned with a deck, barbecue and hot tub sitting under outdoor string lights. If you are looking for a luxury getaway but don’t want the heat of the desert, make your destination Big Bear and stay at Summit Creek Pines. Next story Big Bear Ski Resorts are Now Open!